Job Estimating software written in Australia, designed for Small to Medium Businesses. This fully integrated system from first recording a new sales enquiry, to estimating, quoting, win/loss analysis, purchasing, invoicing, and all the other accounting processes. 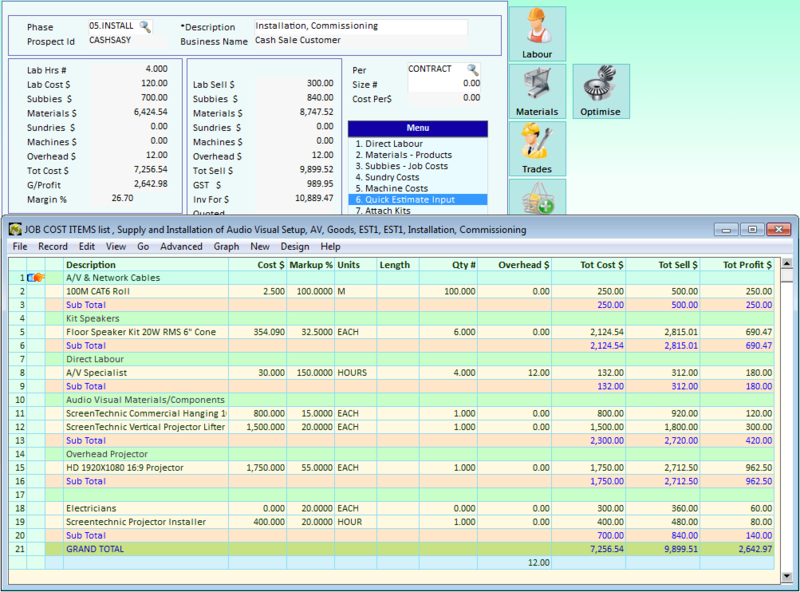 Estimating (Costs, Revenue, Profits) is part of the Job Costing software module. One job (Project) can have several Estimates. 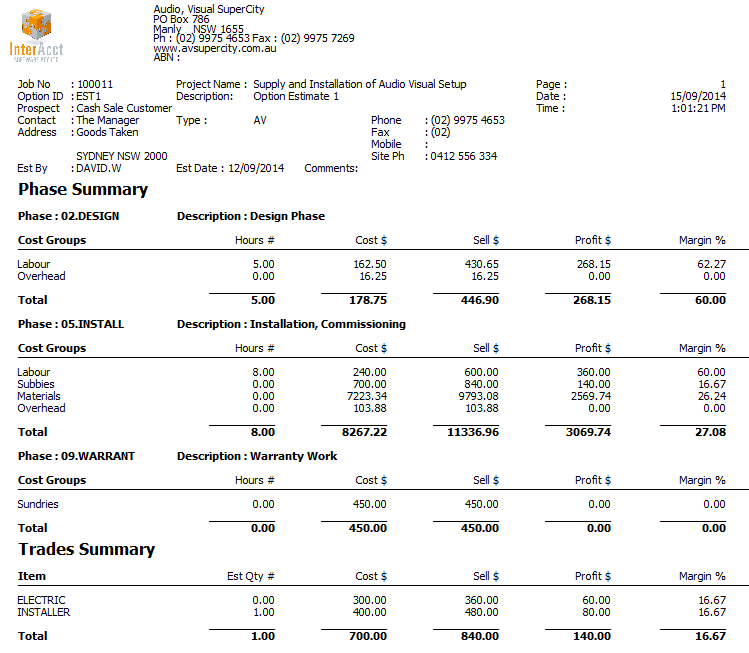 You can copy an estimate from one job to another, or within the same job. 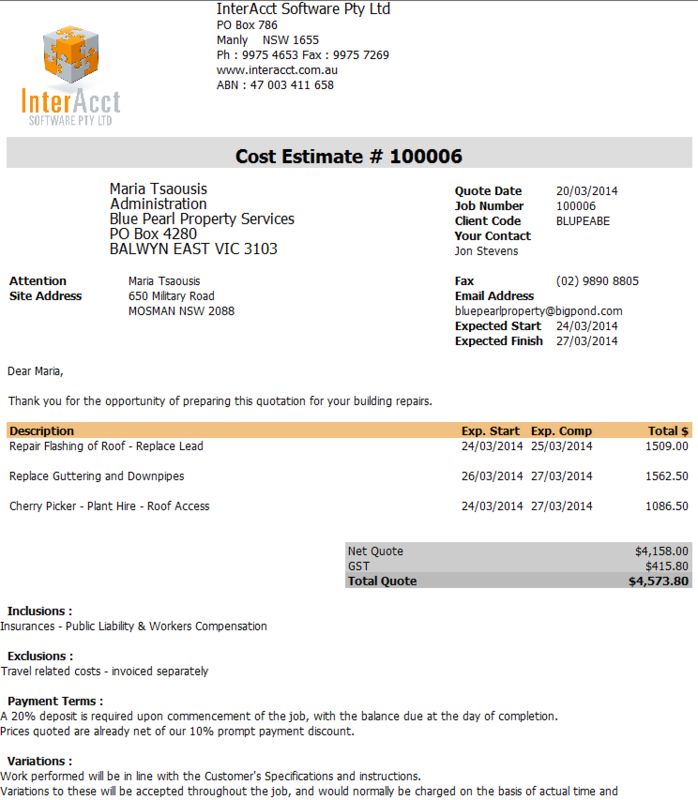 Estimates can be used to create Quotations – either in a detailed or summarised format. Would you like to see what gets sent to the Customer ? Semi automatic estimating can be achieved through use of Kits (templates – Materials, Labour, Subbies, Machine time, Sundries). 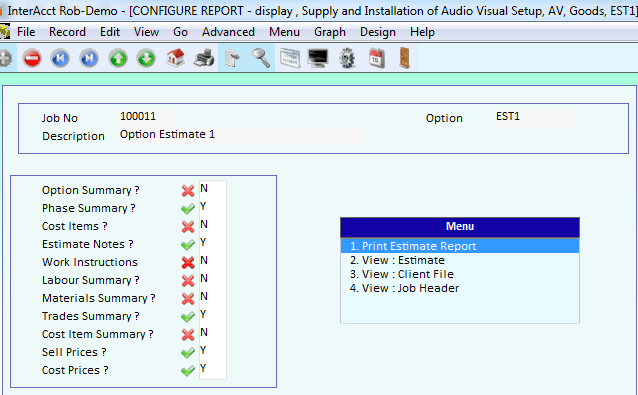 There is the option to create a “Quick” estimate (and quote), or the standard (detailed) Estimate. 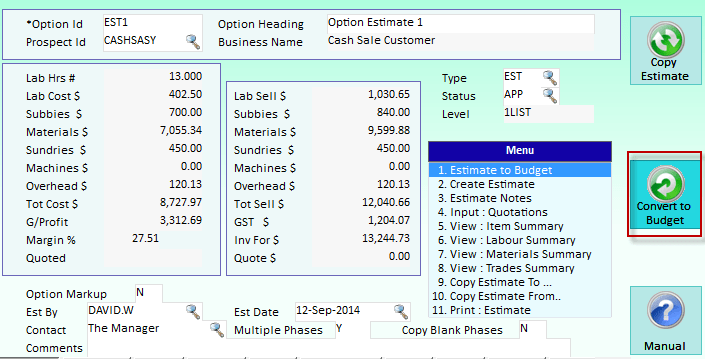 Estimate totals can be summarised into “Phases” (sub-jobs), and then Cost Items. 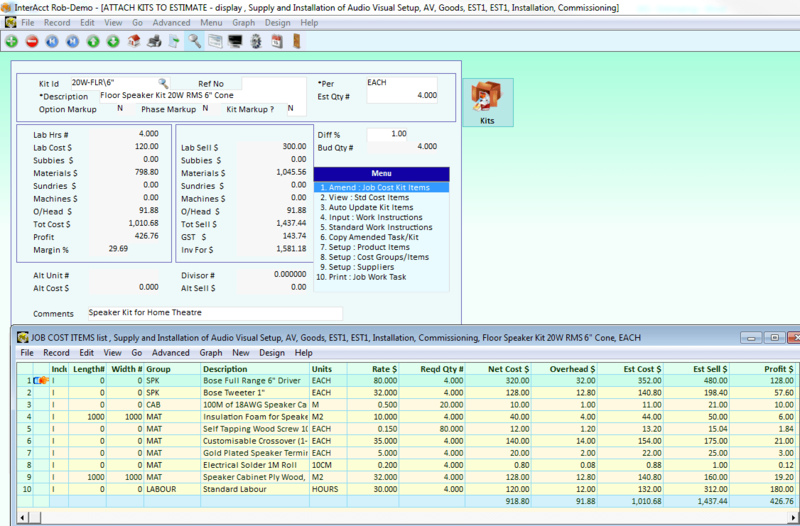 For Material Estimating it shows what stock is currently available, and what would need to be ordered. Estimating is job related – designed to quickly create accurate cost estimates, suggested pricing for quotes, and as an aid to requirements labour/material planning. Estimates can be for Construction jobs, Custom Projects, Civil works, Contractors or more unique industries. We have worked with many over the years. Contact us to see if your needs can be met. One job can have multiple estimates attached. It is possible that (in the early stages) estimates can be linked to different Prospects. 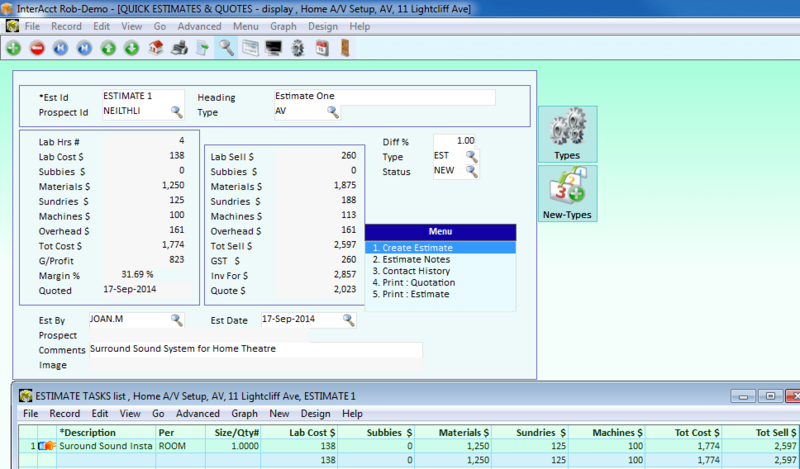 You can copy an estimate from another job, or copy an estimate within the same job. Each estimate is normally broken down into “Phases” of work, although this cost summary can be ignored to have just estimating by Cost Item. Cost Items are grouped into separate files of Direct Labour, Materials, Sub-Trades, Plant Hire, and Sundries. 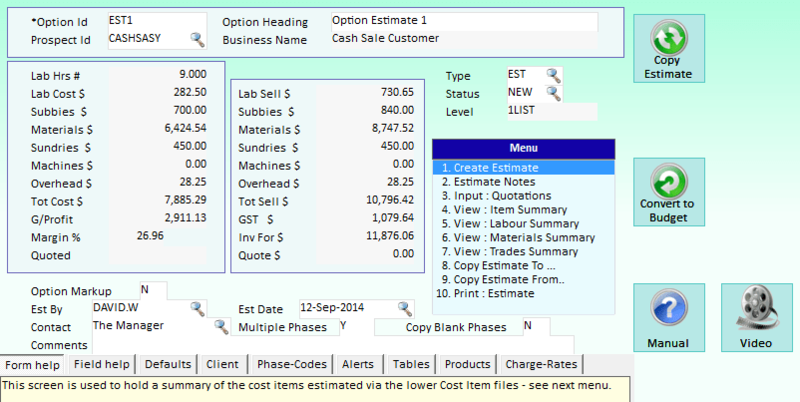 Cost Item estimates can alternatively be entered into a single screen – regardless of the Cost Item type. Labour cost items are input by Labour Class allowing different cost & charge rates. Job timesheets can be entered a number of different ways. 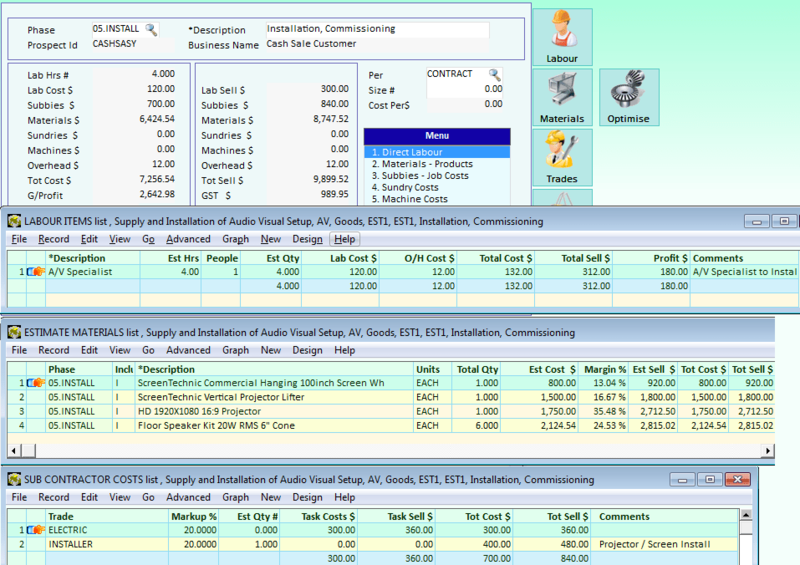 Material estimate interface with the “stock” database for the latest cost information. Quantities can be entered as Each, M2, M3, or Linear Metres. Material quantities can also be entered by physical area within a Project Phase. There is also the option to list materials under ‘Headings’, and have alternate materials as ‘upgrade’ options. The current stock on hand is shown for materials to indicate net and gross requirements. There is also the option to set up standard templates for elements of work (called “Kits”) to semi automatically create estimates. Costs for a Phase are summarised by Cost Group, and can also be expressed as a cost per unit of measure (eg. M2). 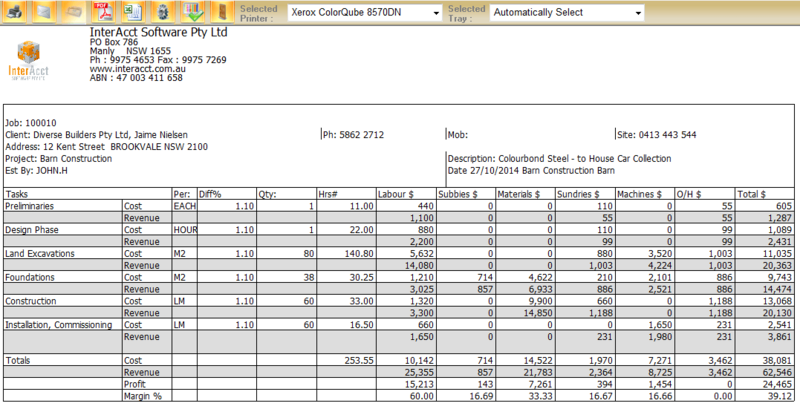 You can also view Cost Item summaries for the overall estimate to see totals required for Material items, Labour, Subbies, Plant Hire hours, etc. 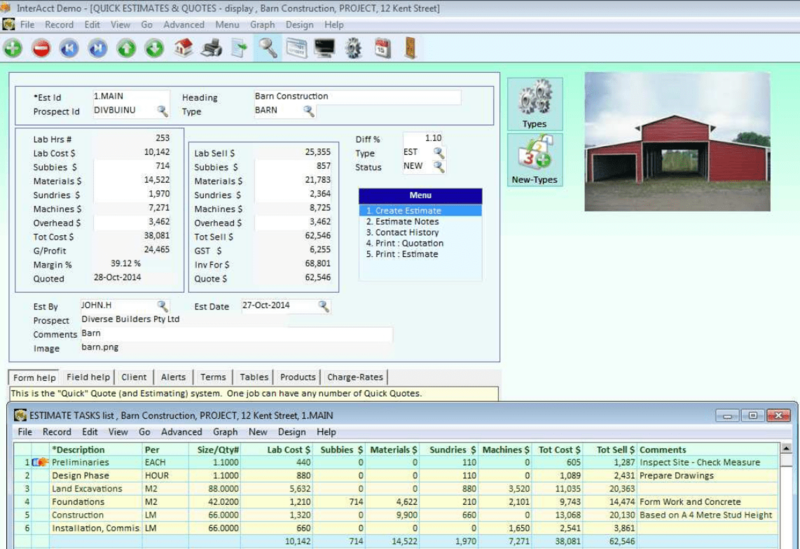 The Cost Estimate can be used to form the basis for creating a Quotation – with the ability to select the level of detail. Alternatively, you can simply use the Cost Estimate as a guide to what the quoted price should be, and create a different Quotation. Once a job was been won, you can select the appropriate Estimate as the basis to copy into the Job’s Budget. If a job is not won, you can record Loss Analysis. Estimates can also be used later as a basis for calculating a Variation to Contract. Contract Estimating with multiple revisions of proposals. 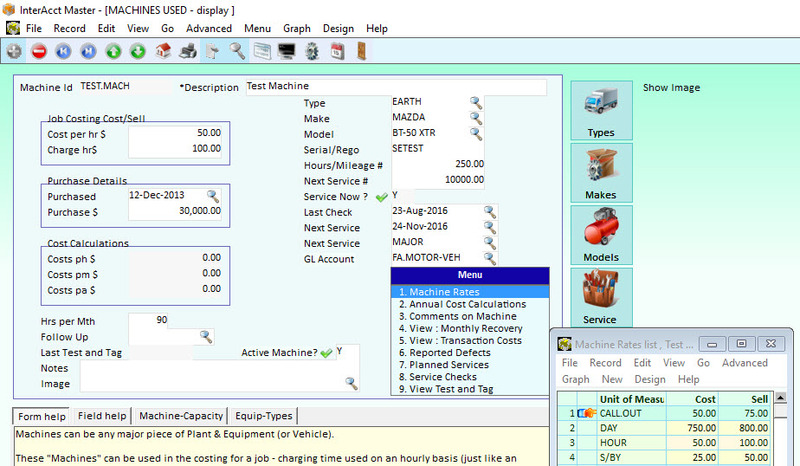 A good Job Management system should start with a strong job estimating, flowing through to a job budget. This can then be compared to actual costs as the project progresses. Job tracking reports and job scheduling allow you to keep a view on all of your projects. 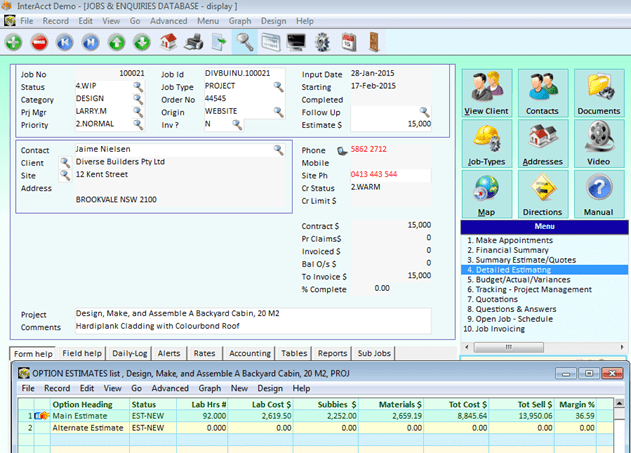 Materials Jobs can also be entered for supply only jobs, or other sales systems within InterAcct can be used. 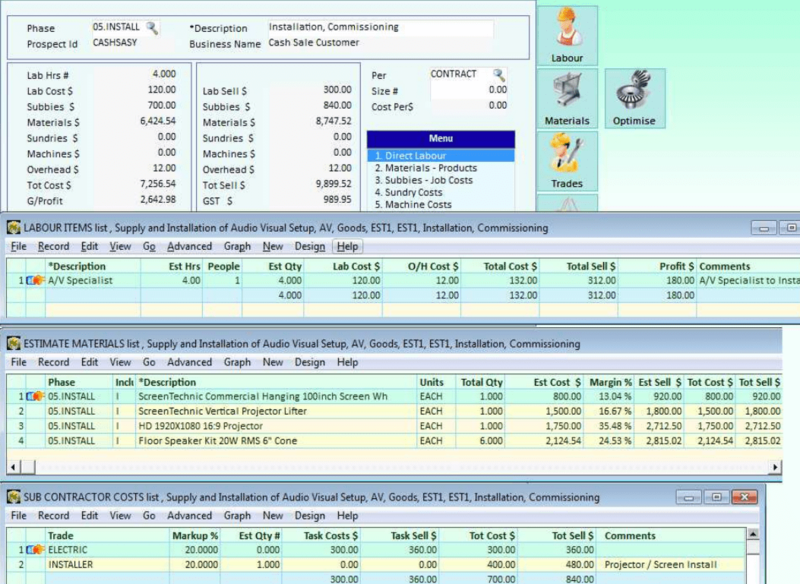 Jobs Construction and processes start from the Job Estimating Software and flows through to all other aspects of the Intergrated InterAcct System. So if you are after Tender Software for large projects or smaller Do and Charge repair work sales InterAcct can suit your needs.